Bring out your favorite chili or soup. 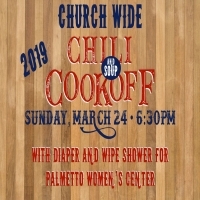 We will eat, fellowship and vote on our favorite chili or soup to see who is the 2019 Golden Spoon winner. This year we are also using this time for us to get together and help the Palmetto Women's Center. They offer many resources to help women before and during pregnancy. There is two ways to help. 1) We are throwing them a Diaper and Wipe shower. Little like a baby shower, we are asking you to help by donating diapers and wipes. 2) Bring in your spare change to drop in the Changelopes that will be place around for you. Every little bit helps. This will be used to assist and supply the medical clinic.